None of the rendering methods will display the title screen at all. It's just black with music playing. The only time I can sometimes get the title screen to display is when I disable the frame limiter to speed through the intros. Then I get a flickering title screen, but if I go to new game, black screen again. I've tried a bunch of hardware hacks but nothing seems to do much of anything. 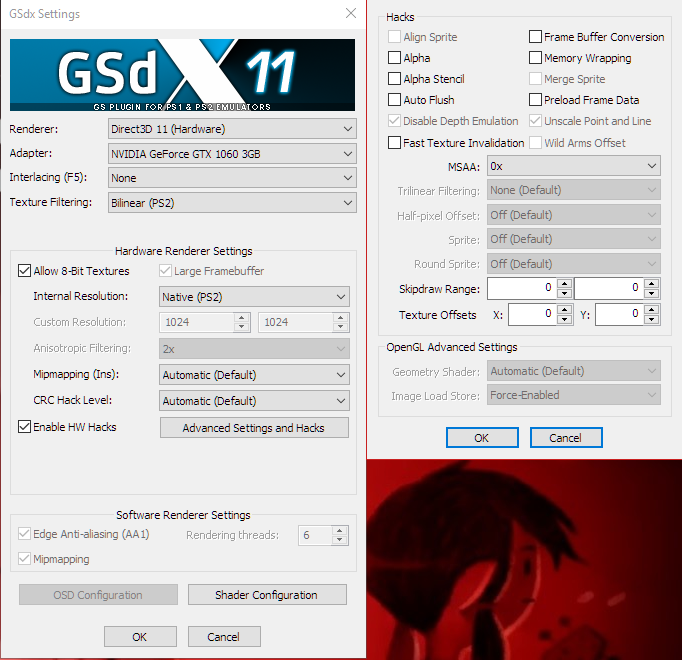 Can you post your GSdx settings please? Flashing title with black screen afterwards. I once was able to input my name. If I choose any upscaling, I turn on the 'unscale point and line' thing to fix the cutscenes looking all gross. However, then I don't get any title screen at all no matter what I do. Ok so I just redownloaded the emulator, reset all my settings, selected openGL, and it works just fine now. Idk why I break this thing so easily. I mess with the settings all the time to fix little things, but I swear I put everything back to normal afterwards. But still I run into things like this.